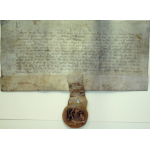 Charter in Latin on vellum. Appended seal. Approximately a third of original remains. 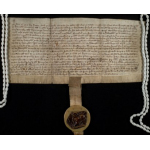 Charter By King Robert I [ Robert The Bruce ] To The Burgh And Burgesses Of Hadingtoun [haddington] Of Their Rights, Liberties, Privileges, Etc.